The Nephilim are first mentioned in Genesis 6:4. My title for this article is actually greatly abbreviated. If I were to have written out the entire title it would have been something like, “What do Peter’s confession of Jesus as the Christ at Caesarea Phillippi, the Nephilim, the worship of Baal, and the locations of Mount Hermon and the land of Bashan all have in common? The question sounds crazy and some Bible readers may not even be familiar with places like Mount Hermon or Bashan, and probably know very little about the mysterious Nephilim. So a very natural question is, “Who knows and who cares?” If you’ll bear with me and read through this entire post, I will try to demonstrate the connection between each of these subjects and what we can learn from their connection. Personally, the connection between these subjects has opened my eyes up to things that I had never noticed in Scripture before. As a side-light, it has also increased my conviction that learning biblical geography can help one better understand and appreciate certain stories in the Bible. I will tackle each of these subjects one at a time. As I move from item to item the picture I’m seeking to convey should become more clear. Much of the insight for this post must be credited to Dr. Michael Heiser and his recent book, THE UNSEEN REALM. Caesarea Philippi is famous biblically for being the place where Jesus asked his disciples, “Who do men say that I, the Son of Man, am?” (Matt. 16:13; cf. Mark 8:27). After the disciples mentioned many well-known biblical people, Jesus asked them, “But who do you say that I am?” To which Peter responded, “You are the Christ, the Son of the living God” (Matt. 16:16). Caesarea Philippi is an interesting place for this confession since, as is usually pointed out by any good commentary, it was a seat of pagan worship in a predominantly Gentile area. The city known as Caesarea Philippi in Jesus’ time, was originally established by Alexander the Great as a countryside shrine to the Greek god Pan located in a cave that possessed an underground stream so deep, it was considered bottomless. 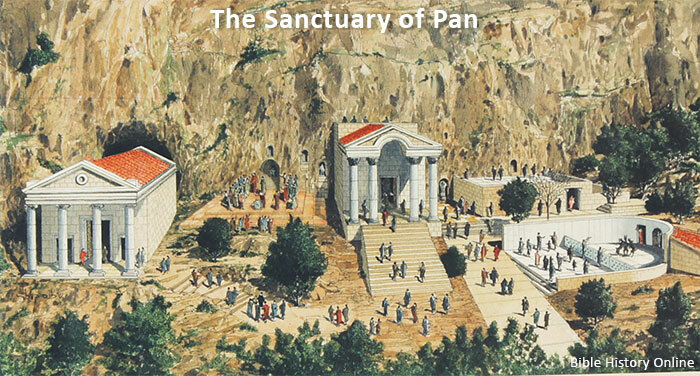 The place was named Paneas and later during the reign of Herod the Great, Herod built a city there. In honor of the emperor, he also built a temple to Augustus. After Herod’s death, his son Philip expanded the size of the city and renamed it Caesarea Philippi in order to honor both Caesar and himself, as well as to distinguish it from the Caesarea built by Herod on the coast. Today the city retains its ancient name, being pronounced Banias (the locals pronounce “p” like “b”). Anyone who checks a good Bible commentary can discover this information, and although it is significant that Peter confesses Jesus as the Christ in this pagan city, it is only the tip of the iceberg when it comes to understanding the history of this area. Caesarea Philippi/Banias sits at the foot of Mount Hermon in this photo, a mountain believed to be the dwelling abode of Baal in ancient times. 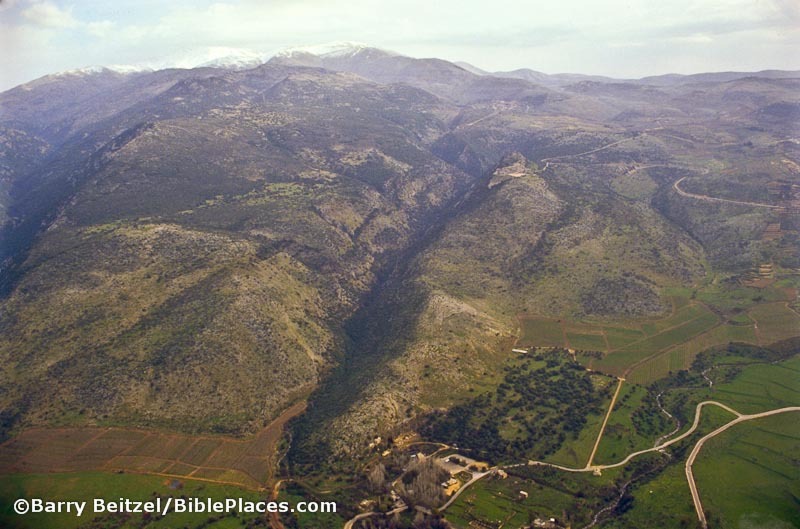 As the photo above illustrates, Caesarea Philippi/Banias is located at the foot of Mount Hermon (see center and bottom of photo). Mount Hermon is part of a range that divided the land of Israel from ancient Syria and Phoenicia (modern Lebanon). The Phoenicians, worshippers of Baal (think Jezebel–e.g., 1 Kgs. 18:19), actually considered Mount Hermon to be the mountain of Baal. 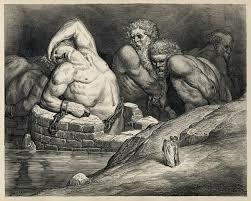 Long before Alexander the Great instituted the worship of Pan in the area, Baal was the main attraction. In fact, Mount Hermon was also known as Mount Baal-Hermon in biblical times (Judg. 3:3; 1 Chron. 5:23). <img class=”size-full wp-image-2399″ src=”http://www.biblestudywithrandy.com/wp-content/uploads/2016/03/1Enoch.jpg” alt=”The Book of Enoch taught that the rebellious angels of Genesis 6 descended from Mount Hermon to mate with the daughters of men and give birth to the Nephilim.” width=”255″ height=”394″ /> The Book of Enoch taught that the rebellious angels of Genesis 6 descended from Mount Hermon to mate with the daughters of men and give birth to the Nephilim. 6:1 And it came to pass when the children of men had multiplied that in those days were born unto them beautiful and comely daughters. 2 And the angels, the children of the heaven, saw and lusted after them, and said to one another: ‘Come, let us choose us wives from among the children of men and beget us children.’ 3 And Semjâzâ, who was their leader, said unto them: ‘I fear ye will not indeed agree to do this deed, and I alone shall have to pay the penalty of a great sin.’ 4 And they all answered him and said: ‘Let us all swear an oath, and all bind ourselves by mutual imprecations not to abandon this plan but to do this thing.’ 5 Then sware they all together and bound themselves by mutual imprecations upon it. 6 And they were in all two hundred; who descended ‹in the days› of Jared on the summit of Mount Hermon, and they called it Mount Hermon, because they had sworn and bound themselves by mutual imprecations upon it (Charles, R. H. (Ed.). (1913). Pseudepigrapha of the Old Testament (Vol. 2, p. 191). Oxford: Clarendon Press.). 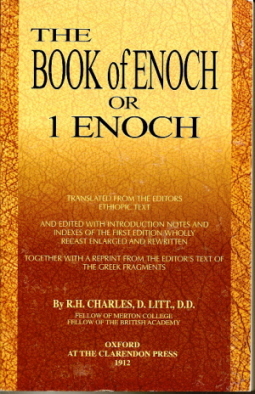 To assert that the Book of Enoch teaches that the Nephilim are a result of the rebellious angels who descended from Mount Hermon, is not to suggest that this is necessarily a historical fact. It is only to assert that it was taught in Jewish tradition to be the place of this event. This tradition further enhances the evil reputation surrounding this area. Jews of the 1st century would certainly have been aware of this tradition, as the Book of Enoch was well-known to them. In fact, Peter, the very one who confesses Jesus to be the Christ at Caesarea Philippi, alludes to the Book of Enoch in 2 Peter 2:4-5. Before leaving a discussion of Mount Hermon, it’s important to point out that its name also has significance. As Heiser states, “Just the name ‘Hermon’ would have caught the attention of Israelite and Jewish readers” (The Unseen Realm, p. 201). The name Hermon is derived from the Hebrew words ḥerem (a thing devoted to God for destruction) or ḥaram (the verb form which means to devote to destruction because it is set apart to God alone). These are the words used in the Conquest narrative (Deut.-Joshua) to describe the utter destruction of the people of Canaan. Heiser believes that this word is particularly connected with the descendants of the Nephilim (e.g., Num. 13:33). Whether Heiser’s theory–that the utter destruction was aimed at the descendants of the Nephilim–is correct must wait for a future post. My point here is that the use of this word once again seems to associate Mount Hermon with the Nephilim. 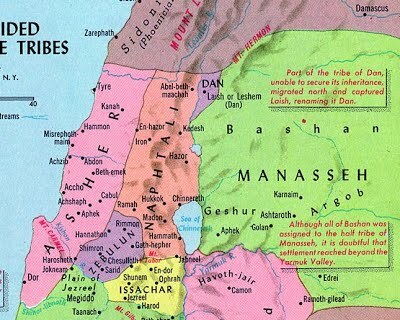 This map shows the area of Bashan colored in green on the right. 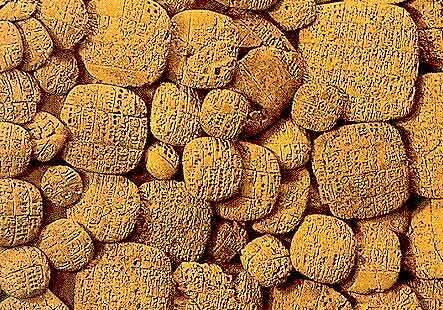 Tablets like these discovered at the ancient Canaanite city of Ugarit further confirm that Bashan was known as “the place of the serpent,” and the territory of the Rephaim. Note the references to Mount Hermon and the Nephilim in this passage. Not only does the Bible state that King Og of Bashan is a descendant of the Nephilim, according to Heiser the designation of Og as an “Amorite” associates him with Babylon. Furthermore, the dimensions of his bed (see Deut. 3:8-11) “are precisely those of the cultic bed in the ziggurat called Entemenanki–which is the ziggurat most archaeologists identify as the Tower of Babel referred to in the Bible” (Heiser, The Unseen Realm, p. 198). All the connections start to become a little mind-blowing, not to mention confusing for some. I’ll leave it to those interested in pursuing this further to read Dr. Heiser’s book. The point here is that Bashan, the territory in which Caesarea Philippi resides, has ancient associations with the Nephilim, as well as carrying the meaning of “the place of the Serpent” The association of Bashan with “The place of the serpent,” as well as being a dwelling place of the Rephaim ( a word used in the Bible for the descendants of the Nephilim) also finds confirmation in the Canaanite literature discovered at Ugarit (see photo on left). 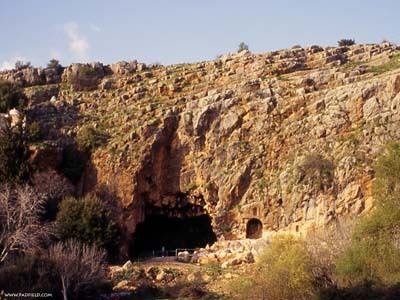 This cave in Caesarea Philippi, known as the Cave of Pan was also called, “The Gates of Hades.” The cave is still visible today to anyone visiting Banias. Finally, in returning to Caesarea Philippi, given the associations of this area with Greek gods, Baal, the Nephilim, and the name “place of the serpent,” it should come as no surprise that it was also associated with the realm of the dead. The Canaanites taught that the Rephaim were the dead spirits of ancient kings, thus associating Bashan with the underworld. Interestingly enough, the Cave of Pan in Caesarea Philippi was called, “The Gates of Hades.” This may be related to the idea that the cave was believed to be a bottomless pit (see comments above). Against this background, Jesus’ statement following Peter’s confession that “the gates of Hades [hell] will not prevail against it (i.e., the church),” is very illuminating! In conclusion, the fact that Peter’s confession occurs in a pagan area is remarkable enough. But when one learns the history of the area and the traditions associated with it, Peter’s confession of Jesus as the Christ the Son of God takes on greater significance. This confession is declared in “the place of the serpent.” It is declared in an area associated with divine (the Nephilim), as well as human (worship of Baal) rebellion. In the darkest place possible, Jesus asked his disciples who they thought he was, and the light of God shone on Bashan through Peter’s confession. Previous PostThe First Century Synagogue at MagdalaNext PostAre New Testament Manuscripts Reliable? This is a great article, thank you for sharing. I do enjoy it. Learning something new is fun. I miss you guys. Thanks Connie. It would be great to catch up with you when we’re in the states. God bless! Great post Randy! I enjoyed this one a lot. Heiser is very thought-provoking huh? Glad I stumbled upon this. Clearly you’ve studied and got a lot right here in terms of the importance of the context for Mt 16. But my question would: How do you come to determine Joshua 12 references the Nephilim when that word is not used and the Rephaim isn’t used in Gen 6? It seems a major point of the flood in Genesis is to destroy the Nephilim. In fact, I would must ask, how do the Nephilim have descendants from a flood that killed everyone but Noah’s family? It seems more like Joshua 12 is speaking of the territory not Og as the remnant (if it indeed refers to the Nephililm); Or, the Rephaim are distinct from the Nephilim, post-flood. Nevertheless, thank you for you study, it’s clear that area has a lot of pagan history that Mt 16 is teaching us Christ is going to destroy and rule over the early and spiritual forces that ruled the area at that time and past times. Thanks so much for the comments and good questions. Although we would presume that the Nephilim were wiped out at the Flood, they do reappear later. Notice first that Gen. 6:4 states, “There were Nephilim on the earth in those days, and also afterward…” The “also afterward” implies that they existed on the earth later. Number 13:33 confirms that the Anakim are descendants of the Nephilim. If the Nephilim are the result of fallen angels mating with humans (which I believe the Bible teaches), one possible explanation for their reappearance is that the Flood did not end the possibility of fallen angels committing this gross sin again. Michael Heiser in his book “The Unseen Realm” offers this, as well as other explanations, for the reappearance of the Nephilim following the Flood. “The Rephaim are presented as a conglomerate consisting of various pseudo-ethnic groups, each with its own characteristics (Gen 14:5; Deut 2:10, 11, 20; Josh 17:15). Thus, e.g. the Anakim (‘descendants of Anak’), builders of fortified cities in southern Judah (Num 13:22; Josh 11:21; 15:13; Judg 1:20), are Rephaim bearing a nickname alluding to their size. The Rephaim were traditionally associated with giants…” Rouillard, H. (1999). Rephaim. In K. van der Toorn, B. Becking, & P. W. van der Horst (Eds. ), Dictionary of deities and demons in the Bible (2nd extensively rev. ed., p. 698). Leiden; Boston; Köln; Grand Rapids, MI; Cambridge: Brill; Eerdmans. So scholars seem to equate the Rephaim with the Nephilim, but your point is certainly well-taken.